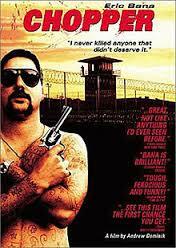 Mark ‘Chopper’ Read was a notorious figure from the eighties through to his recent death. What was he most known for? Killing people. Being proud of killing people. Having his ears chopped off. Oh, and his children books. Good old Uncle Chop Chop. When this film came out back in 2000, I had a friend who vowed to never see it because it was adding to his notoriety and she did not want to contribute to his earnings. I seem to recall that there was some deal with a charity that he did not earn much if anything from the film, but that doesn’t take away from the principle. I do understand the principal, but don’t agree with it myself. It’s all personal opinion, isn’t it? At any rate, Choppper was recently replayed on SBS and I’m glad I watched it. It’s not a pretty film, not by a long shot. There is a lot of violence and quite drawn out painful scenes, and the arrogance of Chopper is quite annoying, but totally believable. I certainly, like any fictional depiction of a life or an event, do not take it as the gospel truth, but I do really like the way the director tells the story – there is a lot of technique in this film, but rather than appearing wanky or annoying, it carries the story along.